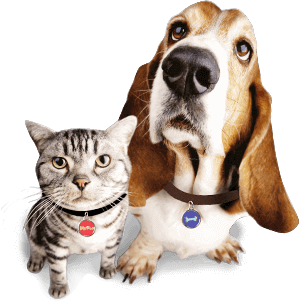 Pet-Tags.com’s pet ID tags will dramatically increase your pet’s chances of returning home if he or she ever gets lost. While pet microchips are extremely effective, they do require a scanner, so the finder must bring the found pet to a veterinary clinic or animal control. This can result in a delay of hours or even days between the time the pet is found and the time when he’s returned to his owners. And if you’ve ever lost a pet, you know how stressful and positively frightening this experience can be! 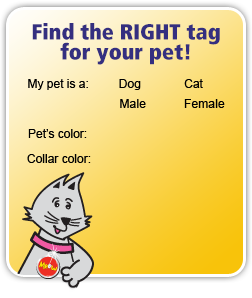 If your pet is wearing an ID tag, the finder can contact the owner immediately upon finding the pet, so you’ll be reunited quickly, which means less stress for pet and owner alike! Post lost pet posters in your neighbourhood, local shops, pet shops, veterinary clinics, grooming shops and other centres with lots of foot traffic. Post a lost pet notice on Craigslist and the many lost pet websites. Contact local animal shelters and animal control to report your pet as missing. Look for your pet at night. Many pets are too frightened to venture out from a hiding spot during the day, especially if the area has a lot of activity, foot traffic and vehicle traffic. The quiet, peace and darkness of night makes your pet more likely to venture out of a hiding spot and they’re more likely to hear you if you call his name. 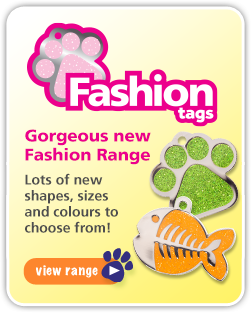 Pet-Tags.com sells a wide range of pet tags for dogs and cats, including fashion tags, colourful designer tags, glitter tags, sparkling bling tags and beyond!